The downpour started exactly 37 seconds into my scheduled 3:30:00 run. “Maybe I should head home” was my first thought. After all, I was heading out for my longest run ever, solo, and the forecast was calling for rain all morning. But then I remembered the time I pulled out of a duathlon race because of the rain. It wasn’t until talking to a pro triathlete the next day that I realized my mistake. Unlike me, she saw the race as a great opportunity to train under difficult conditions. Whereas she jumped at the chance to race in the rain, I chose to avoid it altogether. 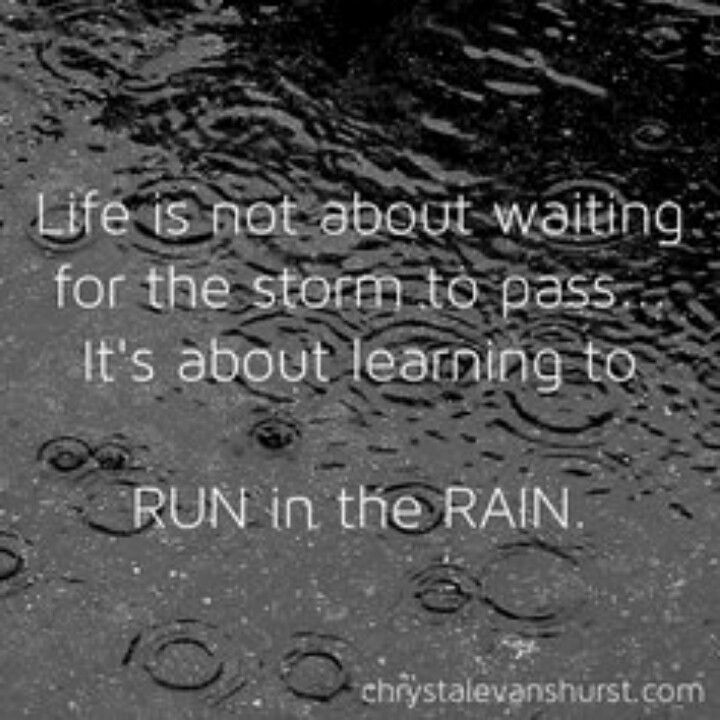 So then I thought “What can I learn from running in the rain today?” Maybe I can gain further confidence in my ability to push thru less than ideal conditions. Perhaps I will learn more about the appropriate type of clothing that will hold up to the rain and prevent blisters and chafing. Will I be able to pull myself away from the negative self-talk and doubt ¾ of the way into my long run? All valid questions, especially since I’m training for an unfamiliar type of race: a 37km trail race in the French Alps. With several massive climbs and severe descents, coupled with the effects of altitude, there will be many unknowns (including weather) and surprises during this race. In other words-I need to prepare for some serious “difficult conditions”! Proper clothing is key. Although it was impossible to stay dry, I stayed warm and had no blisters on my feet. My lightweight t-shirt, tight shorts, thin socks and jacket did the trick. The visor also helped to see clearly through the excessive rain. Lube up! I have traumatic memories of being hauled into an ambulance after finishing a ½ marathon in the pouring rain because of severe chafing in the inner legs. Happy to say that my added layers of cream, combined with the right shorts, kept my skin intact. YAY!!!! Keep moving. Even with the proper clothing, the moment you stop moving, you will start to feel cold. So it was important that my breaks e.g. nature calls, were brisk. Even when I was walking up a big hill, I made sure that I kept a brisk walk. Slow it down. This was a good reminder about how much more slippery EVERYTHING is when wet-including wooden bridges, rocks and roots. The hard-packed surface I was running on also made it very difficult to get any traction, thereby making me walk down several hills and clawing my way up some hills. Safety first! Tune in/tune out. Although I was reluctant initially to run without my music, this turned out to be a good thing. The constant sound of raindrop on the leaves and the rushing water of the river was very calming and serene; it produced a meditation or zen-like feeling for most of my run. 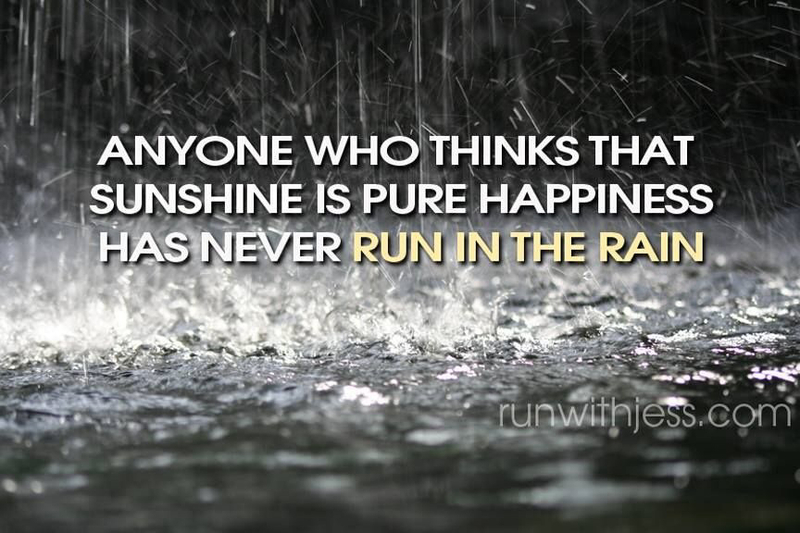 I even forgot about the rain at times—except when I was on the road and kept getting splashed by the passing cars (fortunately, I won’t have to worry about this during my race!). No blisters. No chills. No chafing. No vortex of negative self-talk. Plenty of smiles. Added confidence. Increased mental and physical toughness. All in all…I would say that this was a good day of training!